Winter Skin Protection - Shea Butter Moisturisers! - Amphora Aromatics Ltd – Supplier of pure essential oils and aromatherapy Products. Winter Skin Protection - Shea Butter Moisturisers! Winter Skin Protection! Blends, tips and Amphora products to help keep your skin healthy and protected during the cold weather. Click for more. Another area of our skin which can really suffer during the colder months is our knees and elbows. There are a few things you can do to reduce the appearance of dry skin on these problem areas. Firstly, gently exfoliate using a blend of nourishing oil (Sweet Almond, Coconut Oil or Grapeseed would be ideal) and Epsom salts. Secondly, ensure you're moisturising at least once a day. The best time to moisturise is when you step out of the shower. Soap and shower gel has a tendency to strip our skin of its natural oils which can cause it to dry out. Moisturising straight away can help lock in the moisture and hydrate the skin helping it to deal better with harsh, cold weather. For the winter months, you may find you need a more intense moisturiser to offer more protection and nourishment to reduce the appearance of dry skin. 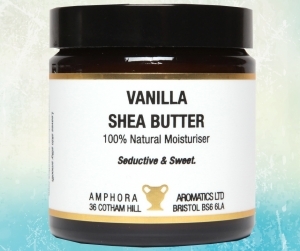 One of the most effective and natural moisturisers I’ve found has been Shea Butter. Shea Butter has been praised throughout the millennia for its abundance in essential fatty acids and vitamins E, D and A. It is highly valued in the cosmetic industry due to its versatile nature. It can be used to treat all sorts of skin conditions including dry and chapped skin caused by weather conditions. Plain Shea Butter has a wonderful, chocolaty aroma so it’s enjoyable to use as well as being highly effective. Here at Amphora we have a whole range of Shea butters including Plain, Frankincense and Rose, Frangipani and my personal favorite – Vanilla absolute! So take your pick from our selection and rest assured that your skin is getting a lovely natural boost to help it deal with everything that winter brings.